Lots of attendees at the Winter 2016 NAMM in Anaheim, CA. I’ve been going to the Winter NAMM Show every year since 1999. During this time, I’ve seen the industry go through changes, trends, and periods of contraction and growth that were always reflected in the Show’s attendance and product announcements. NAMM is definitely a barometer of the industry. A half dozen years ago. I felt like attendance was low and the new product announcements were light, a reflection perhaps of the recession. But over the past few years, there’s been a steadily increasing raucous on the showroom floor as attendance grows and more and more new products are introduced. This year, attendance was seriously off the hook and the floor of the convention center felt like it was packed from the first day to the last — good news for our industry. There are so many manufacturers and products at NAMM that it’s impossible to see them all. So, I always go with a mind to focus on something specific. This year, I was primarily looking for analog synths. And of course, I always keep my eyes open for innovative MIDI controllers that might help take live electronic music performance to the next level. I was not disappointed. Here are just a handful of the standout products that caught my attention. The sweet sounds of Dave Smith Instruments OB-6. What a beauty! Dave Smith Instruments is on fire. Their new Prophet 6, released earlier in 2015, and OB-6, designed with Tom Oberheim and introduced at the show, are truly inspirational. I spent some time playing the OB-6 and it sounds amazing, so incredibly lush and fat. Plus, I really like the look and design that pays homage to the original Oberheim OB-8 (circa 1983 to 1985). However, these beauties come with a hefty price tag—$2,800 and $3,000, respectively—and so will likely be out of the price range of the average musician’s budget. The Korg Minilogue is a steal a $500. Korg to the rescue! I’ve heard Korg’s synths referred to as “the poor man’s Moog.” They’re certainly living up to this label, in all the right ways. The new Minilogue designed by Tatsuya Takahashi, Korg’s Chief Engineer of Analogue Synths, is amazing and even more amazing when you consider its price tag, just $500. It’s well built, very musical, sounds fantastic, and has plenty of bells and whistles; for example an OLED waveform display, a 16 step sequencer, and an audio input so you can run external signals through its filters and waveshaping controls. At this price point it’s hard not to want to pick this up. Can you say impulse buy? And you wouldn’t be sorry. Now, where can I find room to put this on my desk? 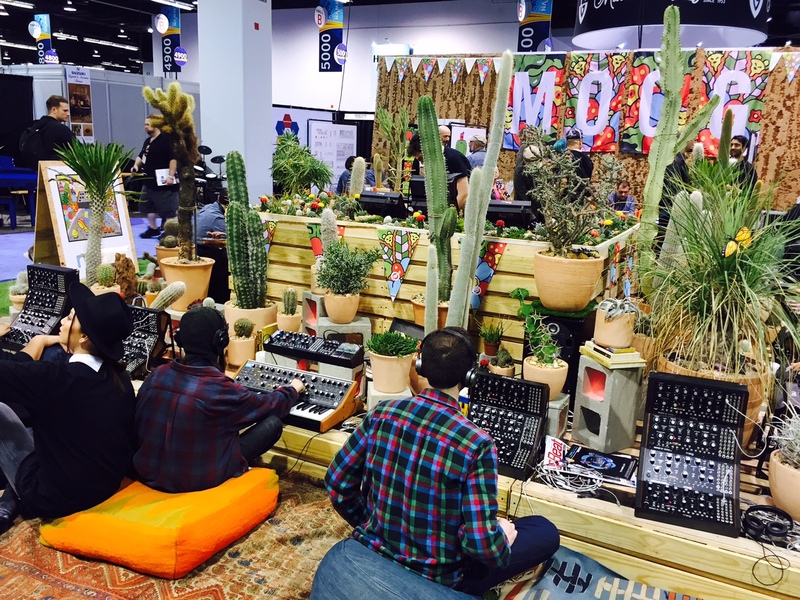 The Moog booth and a lot of Mother 32 modules. I’m always looking for MIDI controllers that might help enable more dynamic stage performances. Here’s a cool new one from Zoom, the ARQ, for $600. It’s a round, tambourine shaped controller that’s covered in 96 finger pads, features a 3-axis accelerometer, and functions wirelessly via Bluetooth LE. 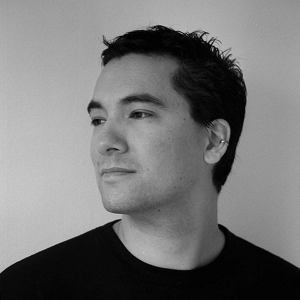 It’s paired with a base station that includes a drum machine, synthesizer, and sequencer for programming loops and music on-the-fly, completely stand-alone, without any need of an external computer or DAW. It’s a party in a tambourine! I’m pretty sure I’ve never said that before. This controller is innovative and has the potential to be a lot of fun. At some point during the Show I always sneak down to the basement, away from the main showroom floor, to see what the less high-profile exhibitors have to offer. This year I found what I think is a really neat MIDI controller software program that employs your laptop’s web camera, roughly similar to how the Xbox’s Kinect motion sensor operates. It’s designed by Shunsuke Nakamura and called Kagura, The Motion Performance Instrument. It’s software that allows you to arrange MIDI programmable objects on your laptop’s screen that you can then point at, from several feet away, to control. The software works best with the Intel RealSense™ camera (which is only on select laptops at this time) that combines a 1080p HD camera, an infrared camera and an infrared laser projector for measuring depth and an increased sensitivity of facial expressions and gestures. I tried the demo that they had running on an Intel laptop and it was incredibly responsive. It’s currently free for download while it’s in development, so reach out and grab it (pun intended). I’m really looking forward to experimenting with this program. Let me know what you think! Downstairs at the Kagura booth. Nakamura demonstrates his motion performance software.